by Carlos Eduardo Ozório — February 16, 2011. One of the gentle art’s greatest champions, famous for the level of mastery he displayed on the mats, Vitor “Shaolin” Ribeiro has been in New York since 2008. After a rough start, now the black belt has dedicated himself entirely to his students. He arrives bright and early at the academy on the third floor of 780 8th Avenue, near 47th, in Manhattan, only leaving after nine at night – so busy are things at his gym. “It was a bit awkward for me at first. Jiu-Jitsu wasn’t all that popular, the public didn’t know much about it. I was concerned, but I relaxed after seeing the long-term success Renzo Gracie has had here,” says the fighter, when GRACIEMAG.com stopped in at his academy. 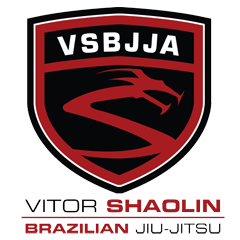 Shaolin has help from some friends from his days in Brazil, among them long-time sidekick Marcos “Loro” Galvão Pereira. The quickly show the benefits the gentle art offers its practitioners. “As soon as they understand it, they realize there’s a number of benefits. They lose weight, make new friends, become healthier, have fun… A lot of people at first are just looking for a means of self-defense, but then they realize Jiu-Jitsu is a lot more than that,” he says in analysis. Vitor is one of the many who abandoned competition for the greener pastures of MMA. He has, however, realized Jiu-Jitsu has hit a new benchmark. “I’ve been rediscovering my Jiu-Jitsu, and now I’m 100% focused on it. I seek to evolve as a teacher. Now the scene is totally different and I’m happy about it. The IBJJF events, for example, are the biggest showcases. That translates into seminars and students. It’s also cool to see how there’s more investment, whether through sponsors or competitions rewarding the winners. Before, you had to go to fighting, now there are a lot of people making a living doing Jiu-Jitsu and are happy. I’m really pleased to have been part of that history and I want to congratulate the whole Gracie family, which helped open a lot of doors,” he says. “The cold still gets to me here, but it’s just another reason to stay in the gym all day,” he says in closing. Now, besides the crew in the photos, check out class and three positions taught by the submission wizard exclusively for his students and, of course, GRACIEMAG.com readers. I have also been attending martial arts classes for the last two years and I must say this sport has changed me in so many ways. Besides, I also learned how to protect myself, especially my family and friends against unruly people.